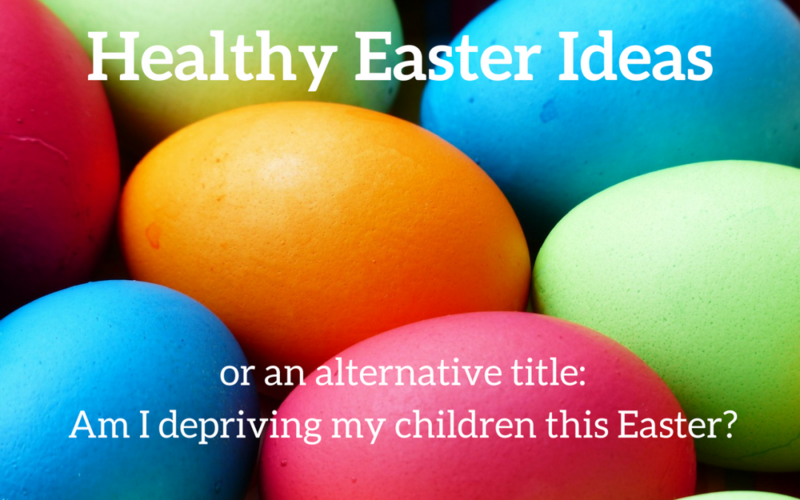 This week I’ve been getting a few messages that I am “depriving” my kids this Easter because we follow a low sugar, low processed food way of eating and won’t be giving them three million Easter Eggs this year. So I thought I’d share what we do for a healthy Easter instead, and show how they aren’t “missing out”! It’s a bit scary just how much sugar most chocolate easter eggs have – at 66% sugar a single Cadbury Creme Egg alone has 5 teaspoons of sugar (nearly a whole day’s worth for an adult!) and most eggs are at least 50% sugar – so we do our best to minimise the sugar while still having fun. When I was growing up, my parents made sure that holidays like Easter and Christmas were really special events – with family traditions, lovely food and celebrations throughout the day (and often days leading up to it!). I’m now enjoying making these special memories for my own kids aged 4 and 2 – but adapting slightly so there is less sugar and processed food and continuing the focus on family, traditions and fun! You can still have fun without piles of chocolate eggs! Last year I bought a punnet of fresh blueberries and hid these around our living room as a pre-breakfast Easter Hunt. This was a total hit and we will do this again this year! balloons and other fun things for little kids, as well as a few of our fundraising Tom and Luke Snackaballs as a healthier alternative to chocolate eggs! We also do presents from the Easter Bunny with another treasure hunt, with clues hidden around outside to find the stash. This year will be some winter pyjamas (getting cold down South!!) and a small toy each. I also saw a cool idea for when the kids are older – buying a lego kit, hiding the pieces in plastic eggs so they make it when they’ve found it all. Dyeing hard boiled eggs is alway fun! Growing a Jewelled Rose has 30 ways to decorate hard boiled eggs, including some cool superhero themed ones my 4 year old would love. Or If you want to try some natural colouring, here’s a great article that includes easy ways you can decorate them using crayon resist or rubber bands. And here’s a simple craft activity from Mud Mates making crayon resist watercolour paintings of Easter eggs. These hard boiled Bunny Eggs are super cute, super healthy and super easy! 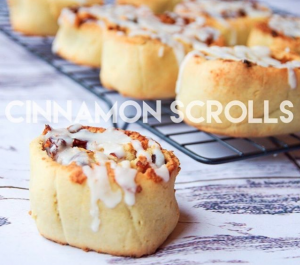 Cinnamon rolls were my mum’s speciality at holidays, and I was so stoked to see this healthier version from Lunchbox Inc last week – will be trying for sure! Pancakes are also a family favourite for special breakfasts. I’m going to try real food nutritionist Mikki Williden’s cream cheese carrot pancakes for an Easter theme this year. 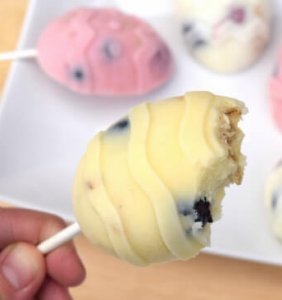 This video for frozen yoghurt Easter Pops has been doing the rounds and look so easy! I found silicone egg molds like this at Spotlight and will do this for a treat after tea. I’m also planning to use some Healtheries No Added Sugar chocolate chips – these contain natural sweeteners like stevia – to melt into the chocolate egg molds. So what do you reckon, am I depriving my children? How do you deal with Easter? Head over to my Facebook page and let me know on the Easter blog post! Fantastic ideas, and what lucky kids. 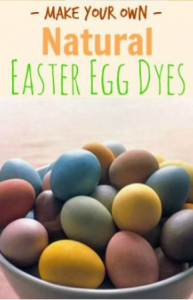 And thanks so much for sharing our Crayon Resist Easter Eggs blog. Happy Easter!